We all have them. Those days where, if it’s going to go wrong, it does. We had that kind of day yesterday. Nothing major or life-threatening, just a day of annoyances and irritations. We had to check out of our lovely Airbnb place and when I was thanking and saying goodbye to our host, she commented that I looked so calm and relaxed about still not having Clancy. I replied that we had been deported from Russia, so this current situation is just inconvenient, not stressful. It’s all about perspective. We were hopeful that we would be able to get Clancy yesterday though, and decided to go and hang out near the freight forwarder’s, in case we got the call to go there. We are the only ones with keys to the car, so when the shipping container is opened, we really have to be present. We decided to revisit The Old Biscuit Mill in trendy Woodstock, have something to eat at one of the eating places there, have a wander around and wait. 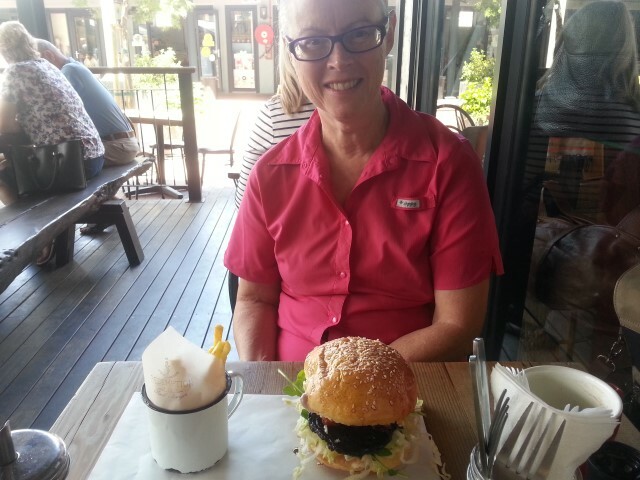 When we were here 3.5 years ago, we had lunch at The Test Kitchen which is located in the Old Biscuit Mill. It doesn’t open for lunch now and we just wanted something simple so we went and had burgers at Redemption Burgers. What really caught our eye about this place was their clever menus. The burgers were delicious too. Table Mountain looms over everything in central Cape Town. We had a walk up and down Woodstock’s main drag, Albert Road. Lots of places to eat, antique and retro shops, clothing stores and other signs of gentrification from light industrial to inner-city trendy suburb. We found a shady spot inside the Biscuit Mill complex and sat and waited for news from the freight forwarder, but by 3.30 we decided that it probably wouldn’t be happening until next week, so we extended the rental car hire again and booked another Airbnb place, only a couple of kms from the previous one. Our potential Airbnb host had been pretty good about replying to messages, but somehow once we’d booked and paid to stay for 3 nights, everything went quiet. We got to the address and rang the doorbell as instructed … nothing. It was just on 5pm and we thought maybe he wasn’t home from work yet, so we waited. Sent a couple more messages, rang the bell a few more times, sent some SMS messages. Still nothing. This place is fairly typical of suburban homes here – very high fence, built like Fort Knox, impossible to get into. This one doesn’t have razor wire or electric fencing, but a lot do. So while we waited, we went off to the local shopping centre to find something to cook for dinner and as he was walking back to the car, Greg noticed that one of the hubcaps was missing. Sigh. We remembered hearing a noise as we were driving on the motorway to the Airbnb, and we now realise it was the sound of the hubcap rolling away. We drove back to where we thought we might have lost it, but couldn’t find it. So, back to the Airbnb, back to no answer when we rang the doorbell. We were starting to think that maybe we’d lost our money and our bed for the night, then decided to phone the number rather than just send text messages. Answered on the first ring and things went smoothly from there. No idea why he didn’t reply to any of the other messages we’d sent, but by that time we didn’t feel like pursuing the topic, we just just glad to get inside and get settled. It’s a nice place and we’re happy to spend a few days here. And now, today has been fine. Lovely weather, Greg took our laundry to a laundry service nearby so we now have clean and beautifully folded clothes, and we went to a different Food Lover’s store where I found packets of dried tortellini and ravioli which is a staple part of our camping pantry and which had eluded me up until now. Food Lovers has excellent produce & meat, and offers a good range of groceries, all at lower prices than the other supermarket chains here – Spar, Pick & Pay, Checkers. We’ll probably go back to that one and stock up before we head off in Clancy. I hope your weekend is going well too. Thanks Amanda. Poor old Clancy is right, but at least he’s in good company with Willy the Troopy. Having travelled overland from Germany to Vladivostok, and just spent a year doing a lap of Oz, Willy probably has some great stories. Clancy has spent the last 2 years in our backyard and before that, he was a farm ute just south of Woodcroft. argh! I bet its not so much the wait as the uncertainty… if they called you and said ‘Ready to go in 5 days’ at least you have a firm day and plan. Wow – thats a huge burger 😀 – and I agree, great menus! Hope Clancy is released soon!! You’re right Lisa, it’s the uncertainty. But this bit will hopefully all be over soon. 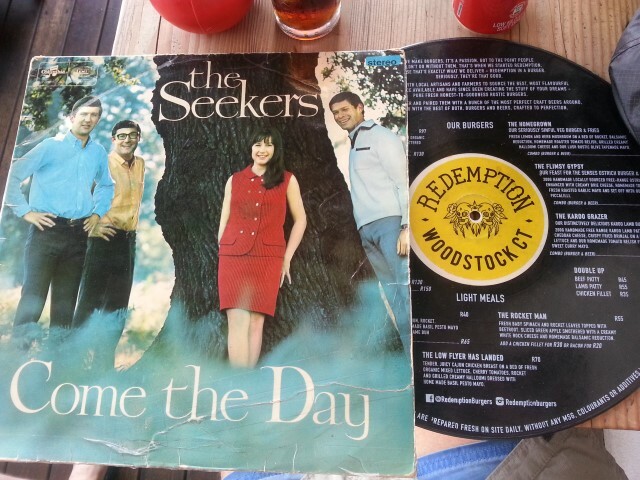 The SEEKERS one of the great bands There,s a New World Somewhere remember being stuck in England that A sol of a place saying I will get out of this place and return to AUSTRALIA.the rest is history Happy Birthday Girl. Next Next post: At last!